Michael Moorcock is one of the great authors living today. 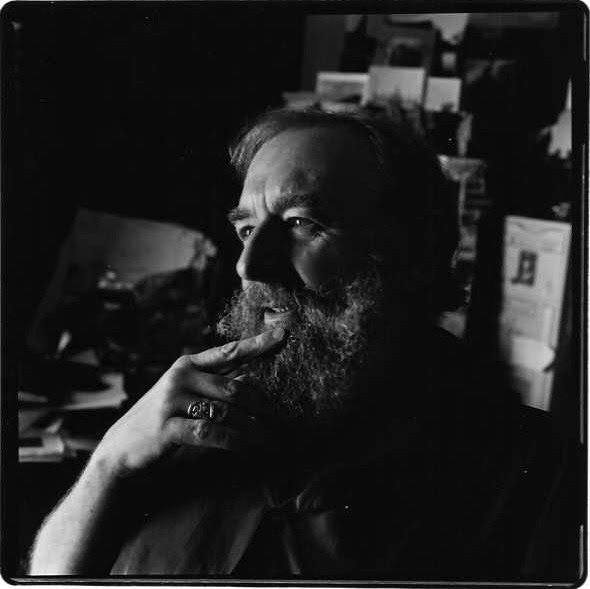 His many awards include the Nebula Award for Best Novella (Behold the Man, 1968), the Guardian Fiction Prize (The Condition of Muzak, 1977), World Fantasy Award for Best Novel (Gloriana, 1979) and the Bram Stoker Award for Lifetime Achievement (2004). He was inducted into the Science Fiction Hall of Fame in 2002. In 2010, The Times named him one of "The 50 Greatest British Writers Since 1945." 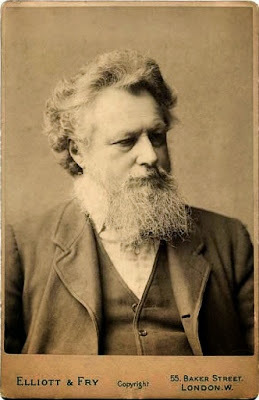 Born in London in 1939, Moorcock became editor of Tarzan Adventures at seventeen and published his debut novel at age twenty-three. 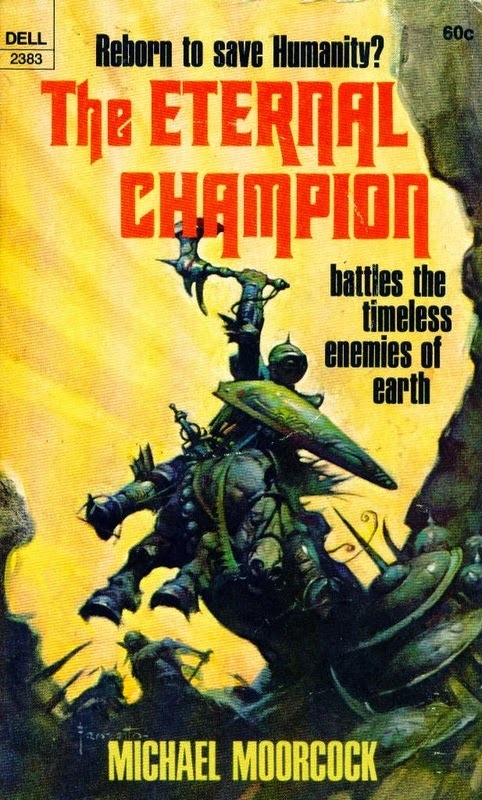 During his first stint as editor of New Worlds (1966-1969), the science fiction magazine was controversial enough to warrant debate in Parliament. The complete list of his novels, short stories, essays, reviews, comic books and musical recordings is almost unbelievably vast. This multi-part interview with the creator of the literary Multiverse only skims the surface of the depth of work created by Mr. Moorcock over the past sixty years. 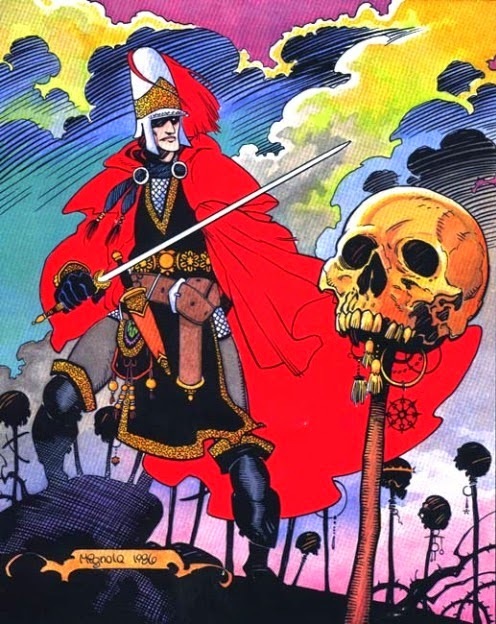 Nearly three decades ago, a friend handed me a copy of Elric of Melniboné and told me it was required reading. I devoured it and read the rest of the Elric series before diving into Moorcock's books about Ulrich von Bek, Jherek Carnelian, Jerry Cornelius, Erekosë, Karl Glogauer and Dorian Hawkmoon – as well as many of his standalone novels, short stories and essays. Not only was his fiction a huge part of my younger years, but his literary and political essays made a huge impression on my thinking. 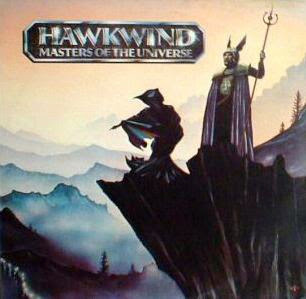 I also clearly remember the moment that I picked up the British space rock band Hawkwind's Masters of the Universe compilation as a teenager in a German record store and saw that Moorcock had written the words to "Sonic Attack." That discovery started a decades-long musical journey that led to my own recordings with some of the fantastic players on that LP. I owe Mr. Moorcock a large debt of gratitude on many levels. 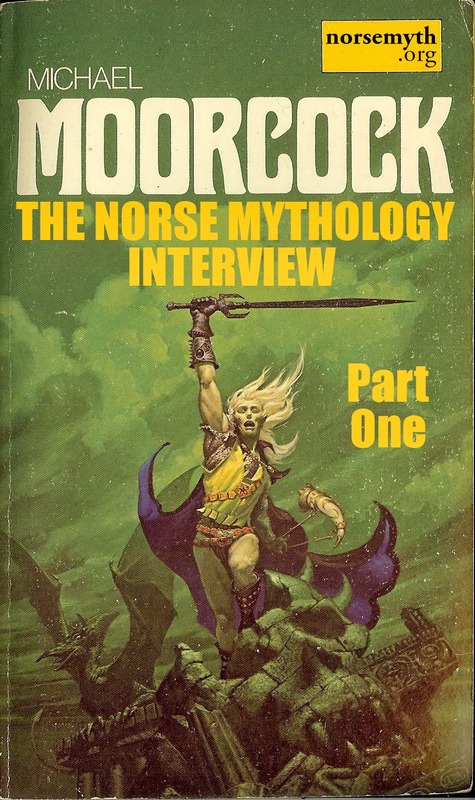 Mr. Moorcock first agreed to be interviewed for The Norse Mythology Blog in 2011. Various things have happened over the years to prevent the interview from happening until now. Blame Loki. I am very grateful to Mr. Moorcock for the time and thoughtfulness he put into his answers. I apologize for the length of some of the questions; the information they provide was less for Mr. Moorcock than it is for readers who may be unfamiliar with some of the references. KS – Part of your early education was at a Rudolf Steiner school, where Norse mythology is hardwired into the curriculum. Were your childhood experiences at a Steiner school responsible for your first exposure to the Norse myths? MM – Very likely, though I was mostly self-educated as far as my enthusiasms went. I think, given the times, there was likely to be less Teutonic myth and legend offered as Celtic. I'm pretty sure I found Norse mythology mostly by myself. I did the same with, for instance, The Pilgrim's Progress [by John Bunyan], which, like the first book on Norse myths I picked up, was a huge influence on me. But I had bought it for the pictures, not the message. However, that book taught me what myths also taught me, that there can be more than one narrative being told at the same time. One of those narratives can concern the moral question, should there be one. In my books, there generally is one. 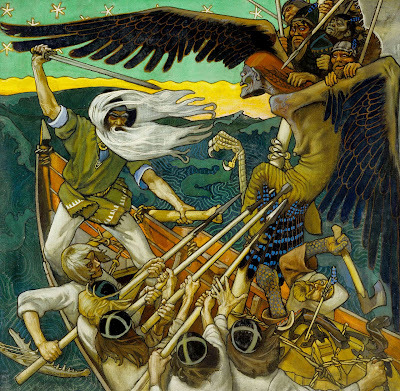 KS – The Finnish epic poem The Kalevala was read to you at boarding school at around age seven. I can imagine seven-year-olds today being asked to play a game on their iPads and to leave the teachers alone (to play on their own iPads). As someone who has been a force for new literature and a champion of progressive change, how do you feel about classic (and Classic) poetry and prose fading from the lives of young people? MM – I don't think they are fading from the lives of those who love poetry. The majority are generally pretty consistent in their liking for sensation and adventure. Although classics might no longer be taught (as Classics are generally no longer a subject), it's worth remembering that universities (in Anglophone countries at least) only began teaching a literature course around the turn of the twentieth century. Interesting to note that [C.S] Lewis was only the second person to do the job after the far more catholic [Arthur] Quiller-Couch at Cambridge and in writing the modernist bible excluded a great deal of good fiction from his Great Tradition. As someone who was largely self-educated and left school at fifteen and who found great poetry and prose for himself, I could make an argument for not teaching literature but allowing people to form their own tastes. KS – You’ve said “from a very early age I was reading Norse legends and any books I could find about Norse stories.” Were you reading the Eddas and Icelandic sagas, or retellings and reinterpretations like those of Padraic Colum and William Morris? MM – Retellings. I read the sagas after I had read about them in books like Myths and Legends of the Norse and so on. Illustrated volumes collecting the myths and folk tales of a variety of cultures were popular at the end of the 19th century and the volumes could be picked up very cheaply secondhand. I had to find the Eddas in the public library. Luckily there was a big one at the end of our street. I did read Padraic Colum and Morris and still do read them from time to time. KS – You’ve said that your Hawkmoon books “were written in a context when anti-German feeling was almost habitual in England. I chose a German hero specifically for that reason and based him on Dietrich von Bern.” Dietrich is a pan-Germanic hero who appears in the German Nibelungenlied, the Old Norse Thidrekssaga, and many other works. He’s a legendary version of the historical Gothic king Theodoric the Great (454-526). Although Dietrich is a major figure in the old literature, he’s not as well known in the English-speaking world as Sigurd/Siegfried and, consequently, hasn’t had such an influence on modern fantasy. How did you become familiar with Dietrich’s story? What attracted you to him as a hero who could be folded in to your Multiverse? 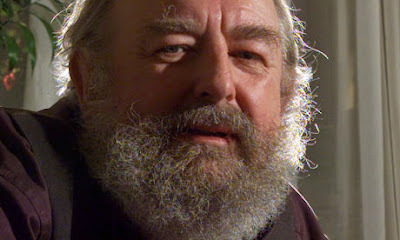 MM – I probably first read about him in Myths and Legends of Charlemagne in one of those series I already mentioned. I don't know why I was attracted to him. Maybe because he simply wasn't Siegfried. There seemed to be fragments of an older, perhaps forgotten, myth in Dietrich, maybe something more deeply pagan. I have always been attracted to the stories of Charlemagne. And don't forget I have a general interest in German literature, perhaps since I read [Thomas] Carlyle's compendiums, and [Hans Jakob Christoffel von] Grimmelshausen was a huge enthusiasm. Few anglophone readers know it and the first translation wasn't made until around 1900. I suppose the impulse comes from the impulse which always makes me look outside the margins, to look at pictures of Hitler, for instance, and try to work out what he's carrying in his pockets rather than considering the historical importance of what's being illustrated by that picture. Hope that makes sense. KS – Of all your creations, Elric seems the one most indebted to Norse mythology. You’ve written that he was based on “the elves of Alfheim” and that the epic ending of Stormbringer was influenced by the Old Norse idea of Ragnarök. How conscious has your use of mythological sources been? MM – Very conscious. I also rejected most plans to use existing mythology (except to a degree in the Corum books which do use existing Celtic myths), feeling my work would contain greater force if I created their mythology myself. But I'm always aware of the influences and inspiration I take from existing bodies of myth, which includes Zoroastrian, Islamic and Hindu increasingly, these days. And a beautiful youth stood where the fly had hovered. The beautiful youth spoke in a beautiful voice – soft and sympathetic and yet manly… His eyes were wise and his eyes were old and when they were looked at closely they could be seen to contain an ancient and confident evil. Loki is pleasing and handsome in appearance, evil in character, very capricious in behavior. He possessed to a greater degree than others the kind of learning that is called cunning, and tricks for every purpose. Today, Loki threatens to eclipse Thor in popularity. He’s arguably the most sympathetic mythic character in both Joanne Harris’ Runemarks series and M.D. Lachlan’s Wolfsangel books. More fans seem to swoon over Tom Hiddleston’s Loki than over Chris Hemsworth’s Thor in the Marvel movies. Why do you think Loki is so attractive to writers and readers today? What need is he fulfilling for modern audiences that Thor and Odin can’t? MM – The trickster tends to be popular during times of social unrest, when we are uncertain about the future. He is more able to adapt quickly to changing conditions. He's in control of chaos, if you like. The morally ambiguous character also tends to be popular at times like our own when we are rather desperately trying to formulate some sort of moral compass, knowing that we have to reject old models (as the trickster does) including old models of authority. I would trust a trickster like Clinton over an upright moral man like Obama to get us through whatever bad times we are facing. Sanskrit stories are full of tricksters who appear to come into their own during periods of uncertainty. KS – Of the forces in your Multiverse mythology, you’ve written, “[s]ince Law and Chaos don't relate closely to Good and Evil, it means that you can have 'bad' Lords of Law and 'good' Lords of Chaos, depending on your perspective and particular ambitions.” This can also be said of the powers of Norse mythology. The gods are definitely not wholly holy, and the giants come in a variety of shapes and flavors. Do you think the old polytheistic religions had a better grasp of reality and human nature than the Abrahamic traditions? MM – Yes. I've increasingly come to see a pantheon as being preferable to a One God. OG was useful politically during a long period of gradual cohesion but now, like many tools which have outlived their usefulness, it's become a liability. We could do with a pantheon again. Perhaps the comics are already supplying it. KS – You’ve written of an “early enthusiasm” for The White Goddess: A Historical Grammar of Poetic Myth (1948) by Robert Graves and The Golden Bough: A Study in Comparative Religion (1890) by James George Frazer. When you became editor of Tarzan Adventures in 1957, you ran articles about pagan traditions and the pagan roots of Christian holidays. There are, of course, elements of Heathen religion that show up in your fantasy works. How did exposure to theoretical works on myth and religion affect your approach to creating your own mythologies? MM – As I said, I thought my work would be more vital if I created my own pantheon and belief system. Some might interpret the Great Balance as the form of a Christian cross. A "religion" which actually talks about and represents ambiguity seems to be a good one for our times! 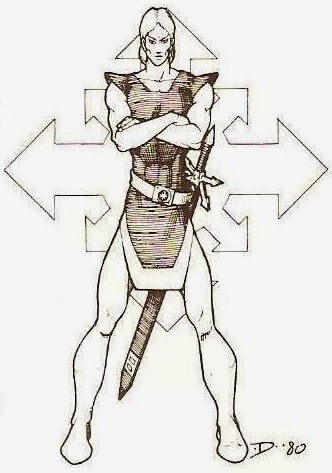 KS – Was Joseph Campbell’s The Hero with a Thousand Faces (1949) an inspiration for your Eternal Champion concept? MM – I've never read Joseph Campbell. My influences were considerable. If he was one then it was via some secondary source. Whoever wrote Beowulf didn't feel obliged to [offer a happy ending], they felt obliged to tell the truth as they understood it. And, like Tolkien or Lewis, put a Christian spin on the story. I'm a Christian only by accident, in that I was raised in a predominantly Christian culture but am not otherwise a "believer" but, that said, I think Christ's sacrifice can be interpreted either sentimentally or robustly, for instance. I think Beowulf offers a robust example, probably in keeping with the times in which the poem was written. The idea of sentimental versus robust interpretation of Christian myth is an interesting one. You repeatedly use sentimentality as a pejorative in “Epic Pooh” (1978), and your Beowulf quote seems to privilege robustness. Since the conversion of Europe, the Western World has made Jesus increasingly robust – from the 8th-century The Dream of the Rood (an Old English poem that portrays Christ marching up to the cross like a warrior heading off to battle) to today’s invocation of Jesus as justification from everything from bombing women’s clinics to willfully discriminating against members of the LGBT community. Wouldn’t it be helpful for modern society if Christians became a bit sentimental and, for example, stopped reading Old Testament tales of Yahweh’s violent revenge and read a bit of Christ’s words on tolerance for others? MM – It would be useful to Christians if they cut loose from the mother ship and dumped the Old Testament. It would be useful to all the various smiters and punishers if they got rid of religion altogether, but then they'd probably find some sort of millenialism as an excuse for murdering people. The commies did it in the name of the future. I think the moment the likes of Thatcher and Reagan rejected the language of liberal humanism in favour of the language of war, sport and finance, the world started running backwards at an appalling pace. We got the Enlightenment from Jesus. We don't need Jesus, or any other political figure (and once religion is organised it becomes politics) unless they bring us back to the Enlightenment and a rhetoric of compassion. I consider sentimentalism – what some think of as gratifying one's emotions – to be an enemy of rationalism, which perhaps suggests it's not always best to be gratified instantly. KS – In very different ways, several of your novels often have characters interacting with gods and other religious figures. 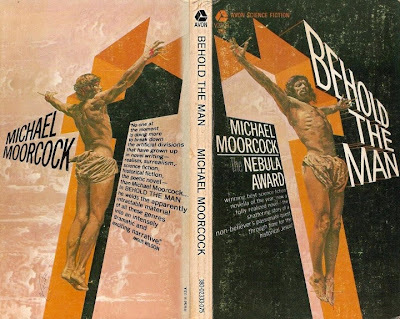 Behold the Man (1966) tells of Karl Glogauer travelling back in time to seek the historical Jesus, only to end up himself assuming the role of Christ. The War Hound and the World’s Pain is centered on Lucifer’s recruitment of Ulrich von Bek in his quest for the Holy Grail. Elric is involved in a Manichaean cosmic struggle between two tribes of gods, the Lords of Chaos and the Lords of Law. After growing up in what you’ve described as “pretty much a straight secular environment,” why have you repeatedly engaged religious subjects in your work? Is it purely as an examination and critique of the beliefs of others, or do you include elements of your own personal spiritual experiences (or non-experiences)? MM – I have a strong spiritual urge and have projected "visions" from an early age, many of them capable of a mystical interpretation. I prefer not to make that interpretation but understand the phenomenon as something which happens to people with a strong visual imagination. I had been exercising that imagination for years before I took psychedelics. Mescaline or LSD merely intensify my existing imagination. Others might interpret the phenomenon as religious. I prefer to understand it as an example of human potential. Many of my characters merely have only to take a certain step in a certain way to be in a wildly different place. Maybe our new tools will help us get to that place better than mysticism ever did? KS – Religious freedom is a hot topic in America at the moment. “Freedom” often shades into imposing one’s own religious beliefs in the secular sphere, often on those who don’t actually share them. As someone who has written extensively from a libertarian and anarchist viewpoint, what do you make of these developments in the United States? MM – There are constituencies in American life which fear education. Where education is bad you frequently find superstition growing at alarming speed. The small town I live in part of the time is in Texas. It has a population of around six to seven thousand. A day or two ago an assistant in our local pharmacy told [my wife] Linda how there were plans to build a mosque in the town and that we should band against it. As far as I know, there are two families from predominantly Moslem countries in the region and they are not religious. When my wife asked who this mosque would serve the woman muttered something about "terrorists." Like most people in Texas (and I suspect much of the world) they only watch a sensational pseudo-news programme, if at all, supplied by [Rupert] Murdoch's empire. It survives by confirming prejudice. They are not educated to learn how to educate themselves. All they want is their ignorance and prejudice confirmed. If you refuse to do that, they simply stop listening to you. They are educated to be ignorant and no further. Libertarians in these parts are "right" libertarians, and all they want to do is remain spoiled children. It's a wonder that in spite of all this there are intelligent progressives in Texas still putting out a newsletter for those of us who might otherwise despair! 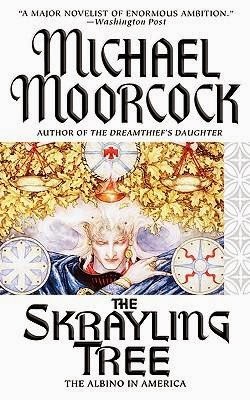 KS – Your novel The Skrayling Tree (2004) brings your von Bek and Elric storylines together and includes elements from the Icelandic sagas, Norse mythology and America’s own history and myths. You played banjo on Robert Calvert’s Lucky Leif and the Longships (1975), a concept album imagining how American culture may have developed if the Vikings hadn’t abandoned their camp at L’Anse aux Meadows, but had instead colonized the North American continent and become the Founding Fathers of the United States. MM – Maybe it could happen. I think the English language had a lot to do with how America was settled and the political paths she took. The revolutionary slogans were, many of them, identical to those used by the Cromwellian revolutionaries before them. That said, I'm not sure America could have been settled by non-Christians. Christianity supplies the rhetoric justifying total war, total genocide. It also contains the rhetoric to make us confused about our practising those things. Perhaps Scandinavian semi-democracy could have mixed well with native semi-democracy – but empires behave like empires. I'm not sure the dynamics would be much different. Thanks for this interview. I loved it! Great interview, but I believe MM means F.R. Leavis not C.S. Lewis. Sorry. Yes, Leavis, who succeeded the great liberal Q.